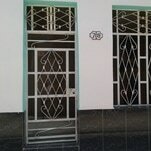 As a young couple we truly believe in the lyrics of our favourite song “En Todas Partes” from the CD Habana Blues. Some of these lyrics were painted on our artistic wall in many different languages. Although we’re a hostel, we’re a family too and want to keep it that way. So, we’ll always do that bit more to make you feel at home, make sure you enjoy your time with us as part of our family and help you with your travel plans on the island. We can give you a hand planning your trip around Cuba. Be ready to have a complete different experience of Cuba. We look forward to meeting you soon and helping you with anything you might need or just want to know. Damas Street #709 between Luz & Acosta, is just 5 blocks away from Plaza Vieja in the old Havana, being then an ideal base to explore all the colonial and cultural gems in the area. Mango Hostel is also a 10 minute walk from the Capitolio, making it really easy to go to about everywhere around in the City on a low budget. 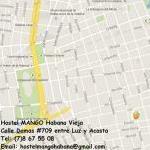 We offer details of how to get to Hostel Mango from: Capitolio, Airport, bus and train stations. You can also refer to our location on google maps. Many travellers download the maps.me app in their smartphone before travelling. Upon arrival they guide themselves offline and arrive at the hostel quite well with it. 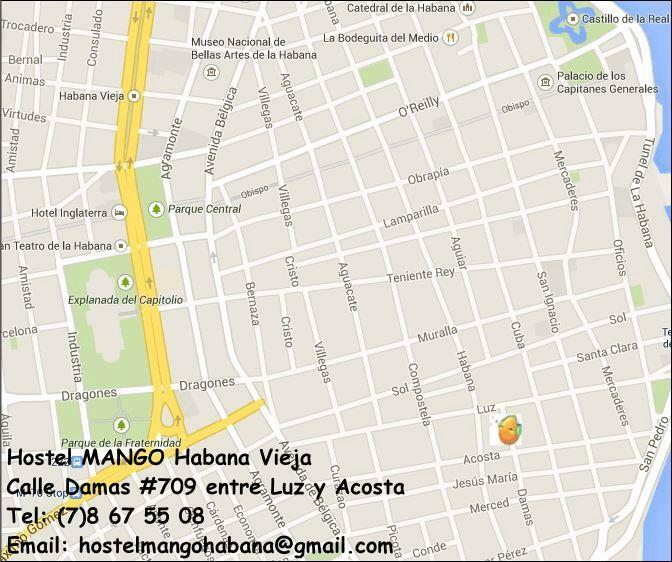 At Mango Hostel in Habana Vieja, we are committed to offer you a great, budget option for your stay in the historic centre of Havana City. Our dorm hostel is located on the ground floor and is aimed to all backpackers, travellers, students, volunteers, nomads, etc… Well, about anyone who wants to have a great time, meet nice people, find tons of local information, benefit from clean, comfortable accommodation with great services and doesn’t want to spend too much. If you leave and come back, we keep on adding up your total of nights and apply the discount retroactively. We now have 1 dorm on the 1st floor, equipped with 3 bunk beds with an ensuite bathroom. A large window and fans ensure enough fresh air and light. Both 110 and 220 volts plugs are available inside the room. The private room is located on the ground floor, with a double bed and access to a shared bathroom. 2 fans and a window facing the corridor ensure enough ventilation. We are not able to offer you a pick-up service at the airport, as the exclusivity is given to the yellow taxis. If you wish to save the time of the waiting line at the money exchange booth (CADECA), we can offer to advance the taxi fare for you and you’ll pay us back with your accommodation. We can also organize custom-made Tours and Activities and we’ll always help you realize your ideas and wishes.